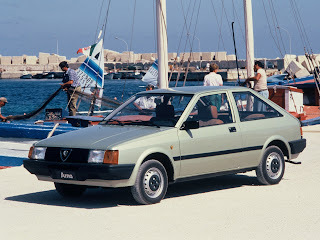 The Alfa Romeo Arna (Type 920) is a subcompact car produced by the Italian manufacturer Alfa Romeo Nissan Autoveicoli S.p.A. between 1983 and 1987. The company was founded on 9 October 1980 as a 50:50 joint venture between the Italian Alfa Romeo S.p.A. and the Japanese Nissan Motor Company. On October 9, 1980, Takashi Ishihara of Nissan and Alfa Romeo President Ettore Massacesi signed a memorandum in Tokyo for increased cooperation between their two firms, and revealed their intent to create a joint production venture called AR.N.A. S.p.A. (Alfa Romeo Nissan Autoveicoli). Italian Prime Minister Francesco Cossiga endorsed the deal, despite political and auto-industry opposition, because he hoped to bolster the fortunes of the state-owned manufacturer, which had a cult following but was losing money. The immediate priority of Alfa management, including Massacesi and managing director Corrado Innocenti was to field a competitor in the increasingly lucrative family hatchback market sector where the compact Volkswagen Golf and Lancia Delta were proving successful, and they hoped an alliance with Nissan would bring a competitive model to market quicker and cheaper. During that period, European countries were engaging in protectionism to guard their domestic car industries, with France even banning the import of Japanese-made vehicles. Working with Alfa Romeo, who controlled a respectable amount of European auto sales at the time was seen as a good hedge for Nissan and a chance to establish a foothold in the European market. For the joint venture, a new plant was constructed in Pratola Serra, near Naples. The body panels of the car were constructed in Japan by Nissan, then shipped to Italy for final assembly. The product of the relationship was launched at the 1983 Frankfurt Motor Show; the car's name was an acronym meaning Alfa Romeo Nissan Autoveicoli. The Arna was essentially a twin of the N12 series Nissan Pulsar /Nissan Cherry (also known as the Nissan Cherry Europe in selected European markets and the Nissan Pulsar Milano in Japan), but featured Alfa Romeo engines carried over from the Alfasud, as well as an Alfa transmission and front suspension. It did however use an independent rear suspension from Nissan. Italian-built cars badged as Nissan Cherry Europe can be readily identified by their rear lighting clusters, which match those of the Arna rather than the Japanese-built Cherry. While British Leyland and Honda had a limited partnership in the United Kingdom at that time, the Nissan-Alfa Romeo alliance was the first of its kind between a European and Japanese automaker with joint investment into manufacturing and development. It was feared by the European Economic Community and ironically, Alfa's future parent Fiat, that the success of this partnership would be a Trojan horse for Japanese automakers to unfairly compete in Europe and decimate the European automotive manufacturing industry. However, such fears were quickly allayed upon the Arna's release when it became obvious that the Arna exhibited the worst qualities of each of its parents. The Arna featured tempestuous mechanicals and indifferent build quality courtesy of Alfa Romeo, married to a Nissan body of questionable build and frumpy styling, with insipid handling common to Japanese cars of the time. This mismatch of technical strengths served to kill the sales of the Arna very rapidly. The Arna is listed as number 26 in the Richard Porter book, "Crap Cars". By 1986, Alfa Romeo's parent company, the Italian-government owned Istituto per la Ricostruzione Industriale was suffering from heavy losses, and IRI president Romano Prodi put Alfa Romeo up for sale, with Fiat ultimately emerging as the new owner of Alfa. Fiat's first decision was to cease Arna production due to its poor reputation, poor sales and to conclude the unsuccessful Alfa Romeo-Nissan alliance. Production ceased in 1987 with Fiat intending to strengthen the competitiveness of the Alfa Romeo 33 as Alfa's entry in that segment. 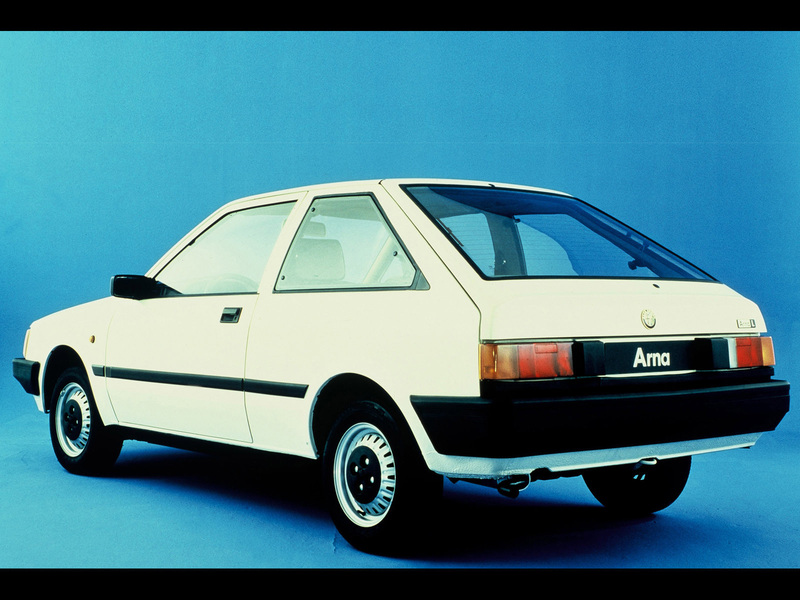 The Arna was initially sold as a 3-door L and a 5-door SL and was fitted with the Alfasud 1.2 boxer engine (63 PS). In 1984, a 3-door TI version, with an 86 PS (63 kW; 85 hp) 1.3 litre boxer-four engine, was introduced, which was capable of reaching 170 km/h (110 mph) top speed. In November 1984 (model year 1985) came a more powerful 1.2 engine in the same trim configurations with 68 PS (50 kW; 67 hp), while there were no external differences there were light alterations to the interior. Later, there were also some TI trim cars built with 1.5 litre engines, sold also as the Nissan Cherry Europe GTI. The more powerful 1.5 TI/Cherry GTI had a top speed of 175 km/h (109 mph). The TI version was discontinued halfway through 1986. In 2000 (when Jeremy Clarkson famously blew one up on Clarkson's Car Years), it was reported that only 340 Alfa Romeo Arnas were still registered with the Driver and Vehicle Licensing Agency in United Kingdom. As of March 2014, there are only three Arnas registered in the United Kingdom, all with SORNs. Last updated on 24 March 2014 at 21:14.